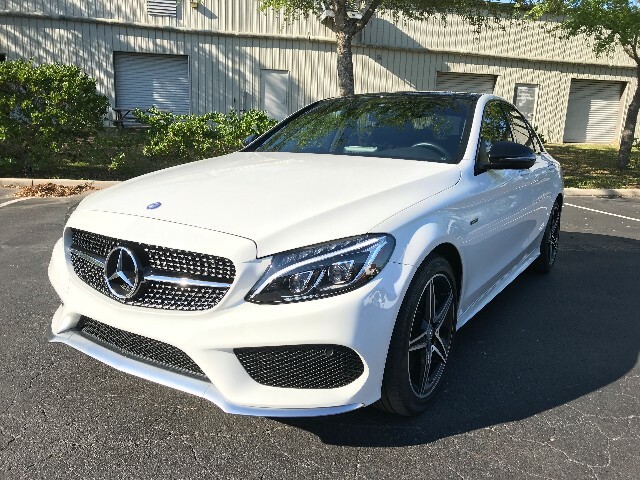 2016 Mercedes Benz C450W4 AMG. Immaculate with Only 15k Miles! Polar White with Black Leather w/ Red Stitching, Classic Red Seat Belts, P02 Premium Package with Burmester Surround Sound System, Rearview Camera, Blind Spot Assist, Rear Side Airbags, Lighting Package w/ Dynamic LED Headlights with Active Curve, Multimedia Package including High Resolution 8.4" Color Display, COMMAND, Panorama Sunroof, 18" AMG Black 5-Spoke Wheels, and Natural Grain Black Ask Wood Trim. No Previous Accidents. Non Smoker. All Books, Keys and Floormats Included. Call Cliff @ 321-436-9523 for more details.Visit us on-line @ TTHMotorgroup.com - Financing available with approved credit and trades welcome.